We are in the midst of Summer (a hot one at that!) so we thought we would revisit the ever present battle: How do you stay hydrated in the hottest time of year? Emily Bushouse brings us a in depth look at hydration, and top tips of how to beat the heat. Runners are constantly trying to pinpoint the hydration “sweet spot,” that is, optimizing fluid intake for peak performance while simultaneously preventing dehydration and over-hydration. During the summer months, finding this sweet spot becomes especially relevant and important for safety. Hydration needs vary from person to person, so it’s important to tune into multiple sources of information to find what’s best for you. When people hear the word “hydration,” they usually think about water and other fluids. However, there are other factors that impact how much fluid you need as well as foods that aid in staying hydrated. The trick is determining what your hydration needs are, identifying strategies that you can incorporate into your routine, and making adjustments as needed. Becoming a master at the logistics may take some trial and error. Here are some things to keep in mind as you develop your hydration plan. In most cases, a one-size-fits-all approach to hydration is not going to be effective. Individual factors, such as sweat rate, body size, and fitness level, all impact how much fluid intake is necessary for optimal hydration. Furthermore, simply following your friend or training partner’s lead means that you’re not tuning into whether your own body’s needs are being met. Pay attention to your thirst levels as well as other signs to determine if you’re on track (more on that later). So much of hydration strategy and success depends on what we do before we ever lace up our shoes to go for a run. Many of our daily habits and routines can help — or hurt — our chances at successfully completing a run (or race). Staying hydrated throughout each day is far more effective than guzzling a glass of water right before a run. Your body can only absorb so much fluid at a time. Make adjustments according to variables such as outdoor temperature, humidity, sweat rate, and thirst level. Start yourself off on the right foot by beginning all runs well hydrated. Quick tip: You can often determine your hydration level by examining the color of your urine. A pale yellow color signals an adequate hydration level. Dark yellow or brown urine indicates a need for more fluids. Paying attention to urine color throughout the day can help you determine whether you are staying adequately hydrated. I’ll bet someone once told you to drink eight 8-ounce glasses of water each day, right? If you’re like me, that may seem daunting. Lucky for you, there are other tastier, less boring ways to get the fluids your body needs. Watermelon, tomatoes, strawberries, cantaloupe, and grapefruit are just a few fruits that are high in water content. Vegetables with similarly high water content include cucumbers, radishes, celery, iceberg lettuce, green peppers, and spinach. To boot, these colorful hydration helpers also contain other disease-fighting ingredients and nutritional supplements such as antioxidants and vitamins. And remember, you don’t have to munch on a bowl of strawberries or cucumber slices to incorporate these foods into your diet. Throw that stuff in a blender with some juice or top off yogurt or salad with your favorites! Sodium also plays a large role in how much water our bodies absorb and retain. Incorporating salty foods like pretzels, olives, pickles, and nuts into your diet can help improve fluid retention. While individual needs vary, the general rule for hydrating during a run is about four ounces of fluid at least every 20 minutes. Again, this depends heavily on the individual and factors like activity duration, workout intensity, and weather conditions. Thirst alone is not a sufficient indicator of hydration needs. It depends. If you are going out for less than an hour and your effort is easy, stick with water. On runs that are shorter and less intense, the primary goal is keeping your body cool and maintaining fluid balance. If you are going out longer and the intensity is greater (e.g. interval, hills, or tempo workout), sports drinks may be helpful, as they aid in replenishing electrolytes. Water is still fine, but you will need another way to replace electrolytes (see below). Caveat: drinking too much water or sports drink can be dangerous! Read further for important information on hyponatremia. What about energy gels and salt tablets? 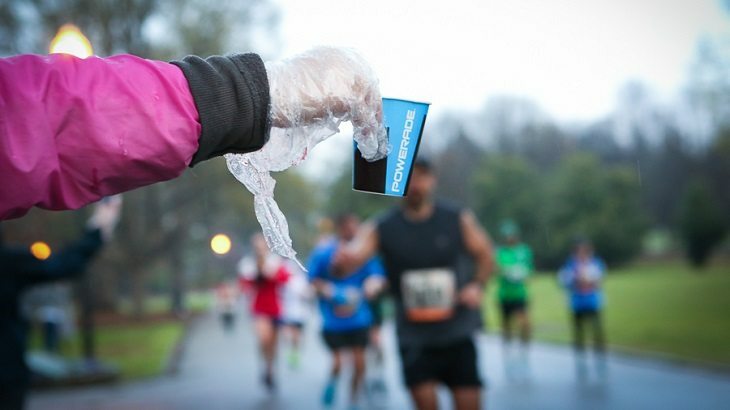 Many runners who go long carry energy gels, energy chews, and/or food when they run. These nutrition products not only address calorie deficits, but also help with electrolyte and sodium balance. On average, consuming about 100 calories per hour is sufficient. Some runners also like to supplement water with salt tablets. If you are a particularly salty sweater, salt tablets may be helpful in replenishing sodium levels, but they aren’t necessary. Keep in mind that there is no hard and fast rule about calorie and salt intake. Experiment and see what your body responds to best. How do I carry it all? This totally comes down to personal preference. Fortunately, there are options: handhelds, fluid belts, and hydration packs are all popular. Most also have one or more pockets for gels, salt tabs, or food. If carrying everything feels like a hassle, other workarounds include stashing water bottles and food on your route, looping by drinking fountains, or running by your car or house to grab what you need. The bottom line is to have a plan figured out ahead of time! Don’t get caught out in the heat without a way to stay hydrated. In hot weather, we are always reminded to stay hydrated. However, just as important are the risks of over-hydration, or hyponatremia. Severe hyponatremia can result in coma, seizure, or even death. Below is a side-by-side of the definitions, most common causes, and symptoms associated with dehydration and hyponatremia. If you experience any of these symptoms, stop running, rest, and recover. Evaluate what went wrong and figure out how to adjust for next time. It may take time and practice, so be patient. Make small adjustments; avoid making drastic changes. Get all your experimentation out of the way before race day. Go early. Get out the door at or before sunrise. Chances are, this will be the coolest time of the day. Go late. Run at dusk. It’s likely to be warmer than at sunrise, but at least you’ll avoid direct sun exposure. Hit the treadmill or an indoor track. There’s no shame in moving your workout inside when outdoor temperatures aren’t ideal. Break it up. Run a few miles in the morning, then run a few miles at night. The longer you run, the more your internal body temperature rises. Split up your workout to keep your core temperature cooler. Seek the shade. If possible, plan your route where you can benefit from some shade. Slow down. Plain and simple: you will run slower in the heat. In fact, for every five degrees above 60F, plan to run 20-30 seconds slower per mile. Swallow your pride and slow down. Slather on the sunblock. While this may seem like a no-brainer, it’s easy to forget (especially if it was dark when you left for your long run at 5am). Plan for it to get warmer and sunnier. Better safe than sorry. Dress accordingly. Wear lightweight, breathable, wicking, light-colored clothing. Get wet. If you run near water or a fountain, splash in some of that stuff! Drench a bandana in the drinking fountain and wring it over your head. These tricks can help keep your core body temperature cooler longer. Know the purpose of your run. Pace and effort are not constant across context. If you’re heading out for a workout, focus on an increased effort, not pace. Adjust your expectations in uncomfortable conditions. If you’re going long, focus on time on your feet, not pace. Know the purpose of your run and get it done! Cross train. On days it’s too hot to run, head to the pool, hit the weight room, hop on a bike, or attend a yoga class. Not only do you get yourself out of the heat, you’re putting in valuable cross training minutes that can ultimately make you a stronger, more well-rounded athlete. Know when to quit. Some days you just have to throw in the towel. Don’t ignore heat advisories. Be smart out there and listen to your body when it’s telling you to stop. Have a Plan B if you need to bail. Know when to be tough and when to be smart. Hydration is a science and an art. There are dozens of tweaks that can be made to every person’s plan. Figure out what’s working and what’s not working. Work from there and make small changes until you find your sweet spot. Van Allen, J. 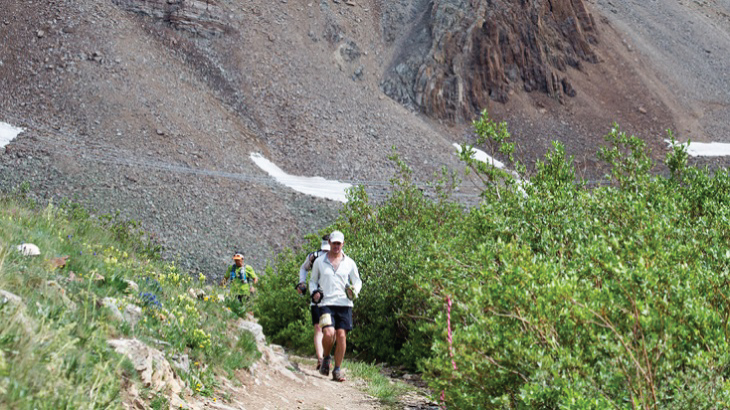 “Running in the Heat: Everything you need to know about running in the heat.” Runner’s World. 25 April, 2013. Web. 20 July, 2016.